The project is part of a new $1.25-million innovation program from the McCain Foundation. FREDERICTON — New Brunswick researchers are plotting what they call the "factories of the future" by developing 3D-printing technologies they said could pave the way for the next industrial revolution. Mechanical engineer Ed Cyr is studying the applications of artificial intelligence in manufacturing 3D-printed materials as part of a $1.25-million innovation program from the McCain Foundation announced at the University of New Brunswick in Fredericton Tuesday. 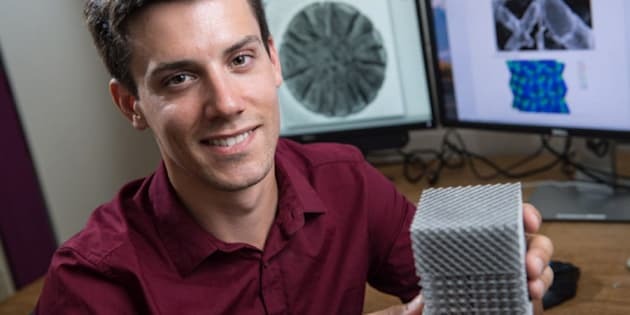 Cyr will spend his UNB fellowship, valued at $50,000, working to understand the behaviour of 3D-printed materials with the goal of harnessing their special properties to improve conventional methods of manufacturing. "We're not really sure how these materials behave, and how to best use these new methods," Cyr said in a phone interview. "If we can understand why (these behaviours) are happening ... then we can design the part to use the best part of that behaviour." Unlike traditional manufacturing processes, he said, in which the desired object is extracted from a block of material, additive manufacturing — the industrial version of 3D-printing — uses chemical compounds to build a digital design layer by layer. Cyr intends to take the advantages of this technology to the next level by developing 3D-printing methods capable of introducing new behaviours that cannot be found in conventional materials. For example, he said he is studying a printed aluminum alloy that, when put under certain types of stress, increases in strength far more than a typical sheet metal. "That would be useful for something like armour, perhaps, or maybe even building the wall of a ship," he said. "For impacts happening at higher speed, like an icebreaker, it would become stronger instead of more brittle." Later in his research, Cyr said he wants to "push the boundaries" of manufacturing by investigating the possibility of 3D-printing powered by thought. "For a human to sit down and come up with the optimal design, we would have to come up with thousands, and thousands, and that would be incredibly time consuming," said Cyr. "The beauty of a computer is it has the ability to go through those thousands and thousands of designs. It can actually model a total design space and tell us which one is the best, and it can even come up with things we might not even think of." It may seem like the stuff of science fiction, Cyr acknowledged, but he said artificial intelligence is already testing the limits of what we thought possible. For example, Cyr said researchers in Europe have developed 3D-printing technology for a "bridge (that) could build and design itself." According to Cyr, the machine scanned the distance the bridge needed to cross, simulated its structure, and then printed it. "It looked at the problem, designed its own solution, and then built it," he said. Mohsen Mohammadi, Cyr's supervisor at UNB's Marine Additive Manufacturing Centre of Excellence, said he hopes to take this research out of the lab and into the manufacturing plant as soon as possible. "We start up from the nano-scale, move up to micro-scale, meso, macro and then we think that we can change things in macro," said Mohammadi. "I think for sure we will see the factory of the future soon ... and it's going to revolutionize the whole manufacturing medium." Mohammadi said the plan is to test Cyr's research by pairing 3D-printing technologies with conventional machinery to create pilot "factories of the future" in New Brunswick. "All these new technologies, they sound actually far away, but they are coming to us," said Mohammadi. "If we don't practice them here in New Brunswick, in Atlantic Canada, in the Maritimes, we will be behind." While the so-called "age of automation" may have depressed some labour markets, Mohammadi said he believes the "age of augmentation," with industry enhanced artificial intelligence, could be a job creator in the province. "Our workforce will have a new tool in their tool box," he said. "We are not only actually going to affect the number of workforce, we think these will actually train the workforce for the new generation of technologies."